This year I have succeeded so far in avoiding centenary celebrations, but some of them are definitely interesting from the perspective of legal historians. 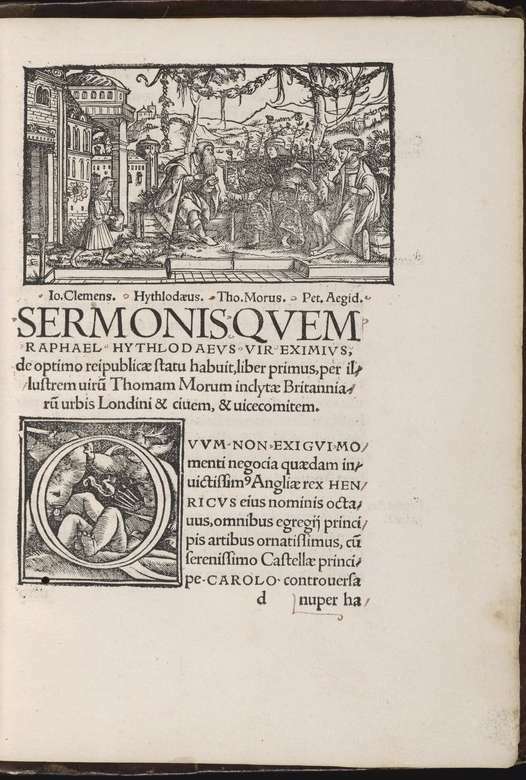 In 1516 Erasmus published his edition of the Greek text of the New Testament, the Novum Testamentum graece, with for us a remarkable title, Novum Instrumentum (…) (Basel: Johann Froben, 1516; VD16 B 4196; online for example at the Swiss portal e-Rara). Even with all its shortcoming this edition proved to be a starting point for many developments in scholarship and theology. Legal historians might prefer to leave the onset of the Reformation to church historians and theologians, but they will certainly not want to forget another book published in 1516, Thomas More’s Utopia (Louvain: Dirk Martens, 1516; more bibliographic details in the Short Title Catalogue Vlaanderen). The flood of literature about More, his book and his circle make it almost impossible to look at it without preconceived opinions and views. Is it possible to say something new, something worth reading at all within the compass of a blog post? However you may think about this state of affairs, I would like to present one of the main figures appearing in More’s Utopia. Pieter Gillis was a humanist scholar who merits attention for his work in the field of legal history, in particular with his edition of a source for the history of Roman law, yet another book printed by Martens in Louvain. In fact, it is seldom noted at all Gillis was a trained lawyer, and thus certainly prepared for his tasks as the city registrar of Antwerp. He is not the only lawyer you will encounter here. Why should authors in the early sixteenth century turn to Dirk (Thierry) Martens (1446-1534) for the publication of their books? The Nationaal Biografisch Woordenboek has a fine article on him (vol. VI, col. 633-637). Martens printed his first book already in 1473 in his native city Aalst. He was among the earliest printers of the Low Countries. His first publication – published together with Johann of Paderborn – was a religious work, the Speculum conversionis peccatorum of Dionysius Cartusianus (Denis of Ryckel), a book digitized in the Flemish digital library Flandrica (GW 8420). From 1492 onwards Martens had his firm in Antwerp and since 1512 in Louvain, the only university town of the Low Countries. In 1491 he used for the first time in the Low Countries Greek type fonts. Printing the works students needed provided him with a stable market. Martens is even credited with promoting the use of the Roman type font. He was definitely a printer with some remarkable feats on his record. 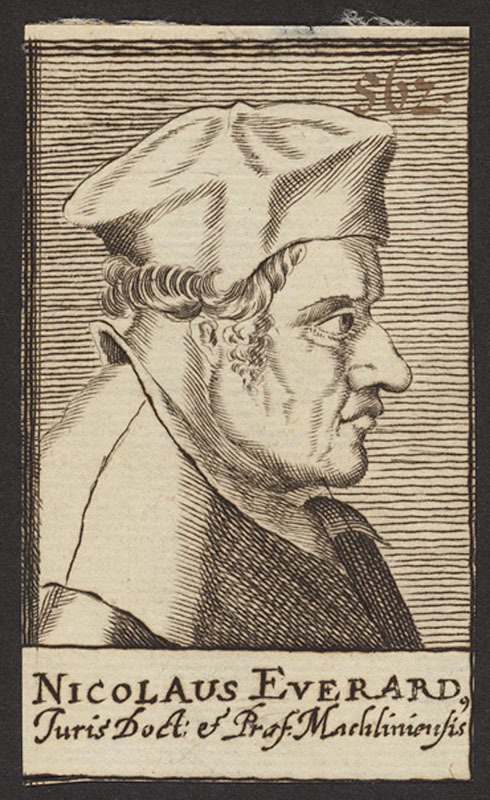 Pieter Gillis (latinized Petrus Aegidius) (1486-1533) initially studied law at Orléans (1501). However, soon he became active as a corrector for the printing firm of Dirk Martens. Already in 1503 or 1504 he met Desiderius Erasmus, one of the authors coming to Antwerp to have his books published by Martens. In 1504 Gillis registered as a student at the university of Louvain, and in 1509 Gillis became the city registrar of Antwerp. In 1512 he got the degree of a licentiatus in law from the university of Orléans. Dealing with Gillis is indeed entering also the book trade of his time, one of the reasons I supply for the book titles in this post at least some bibliographical references. The NBW has a good biographical article on Gillis by M. Nauwelaerts (vol. I (1970), col. 4-7). A much older article in German by A. Rivier for the Allgemeine Deutsche Biographie can also be consulted online (ADB I (1875) 125-126). Before going to More’s Utopia I must acknowledge here the great assistance offered in writing this post by the very useful and extensive International Thomas More Bibliography of Romuald Lakowski. The story of how More came to write Utopia scarcely needs retelling. As a diplomatic envoy he met Pieter Gillis in 1515. The two men became friends, and one of the fruits of their meeting was More’s book. In the prologue of Utopia More tells about his encounters with Gillis and Raphael Hythlodaeus, the stranger recently arrived from Brazil whose stories are the very heart of his book. When preparing this post I wondered where people would have found the famous images taken from the first edition of Utopia, the image of the island and the Utopian alphabet. Surely this last feature came into existence thanks to the suggestions and expertise of both Gillis and Martens. Lakowski provided me with the link to a digital version of the first edition of Utopia at a library where you probably will not expect a copy, the Gleeson Library of the Geschke Center at the University of San Francisco. The digital books in this library cannot be found using regular online search tools such as the Karlsruher Virtueller Katalog and the Universal Short Title Catalogue (University of St. Andrews). Other early editions such as the one published in Paris by Gilles de Gourmont in 1517 (Gallica) and the famous edition by Froben (Basel 1518) can readily be found in various libraries, the latter for example in the Folger Shakespeare Library, Washington, D.C. The Latin text of More’s Utopia can be searched in several ways. You will find just the text in The Latin Library, and a colourful version at the Bibliotheca Augustana of Ulrich Harsch, based on the version created at the Oxford Text Archive. For a linguistic approach you can benefit from the search functions offered in the version at IntraText. At first I would have preferred to leave translations out, and thus honour the principle ad fontes so dear to sixteenth-century humanists, but having a translation within your reach is most helpful. The first translation of More’s Utopia was the work of a legal humanist, Claude Chansonnette (Claudius Cantiuncula). Interestingly Cantiuncula (around 1493-1560) had been at Louvain before going to Basle where he published his translation Von der wunderbarlichen Innsel Utopia genannt das andere Buch (…) (Basel: Bebelius, 1524; digitized at the Bayerische Staatsbibliothek, Munich). Cantiuncula decided to translate only the second part of More’s book, not the first half. At this point it is most welcome to point to the bibliographical survey of people connected to Desiderius Erasmus, Contemporaries of Erasmus. A biographical register of the Renaissance and Reformation, [CE] P.G. Bietenholz and T.B. Deutscher (eds.) (3 vol., Toronto-Buffalo-London 1985-1987; reprint 2003). This work contains entries for Pieter Gillis (CE II, 99-101), Dirk Martens (CE I, 394-396) and Claude Chansonnette (CE I, 259-261), and of course for Thomas More (CE II, 456-459). Among the modern German translations of Utopia the version of historian Gerhard Ritter (1898-1967) is still being reprinted. Ritter made his translation early in his career (1922). You can see in a post from last year my photograph of several pocket law books accompanied by the modern incarnation of Ritter’s translation which gives you also the Latin text. The excellent website of Lakowski with its most useful bibliographies for many subjects concerning Thomas More and his Utopia taught me looking at legal matters around Thomas More is not something new. In this post I will just look at a few aspects. Let’s go back to Pieter Gillis who published in 1517 a number of sources in the field of Roman law. Dirk Martens printed his Summae sive argumenta legum diversorum imperatorum… Caii et Iulii Pauli Sententiis (USTC 403069; digital copy at the Digitale Sammlungen, Munich). The Latin title of his book is certainly long, but it does clearly indicate the constituing parts edited by Gillis. His work contains the editio princeps of the Epitome Aegidii, a shortened version of the Breviarium Alaricianum/Lex Romana Visigothorum, in itself a reworking of the Codex Theodosianus. The manuscript he used contained also a shortened version of Gaius’ Institutiones (Epitome Gai) and the Sententiae Pauli. Among the rare Early Modern editions of these texts is a very rare book by the famous Dutch book collector Gerard Meerman, Specimen animadversationum criticarum in Caii Jcti Institutiones (…) (Lutetiae Parisiorum: apud Merigot, 1747). The story of Pieter Gillis’ edition is intriguing. What manuscript did he use? Surprisingly Marcel Nauwelaerts wrote in his article for Contemporaries of Erasmus about Gillis’ edition “of which is a manuscript is preserved in the library of the University of Leiden (MS BPL 191 ba)” (CE II, 101). Is there truly a manuscript once owned or written by Petrus Aegidius? Many manuscript catalogues at Leiden can be consulted online in its Digital Special Collections. The manuscript Leiden, UL, BPL 191 BA can even be viewed online. The catalogue entry by P.C. Molhuysen makes it very clear this manuscript belonged to Paul Petau who wrote a brief summary of the content on the flyleaf. It seems Nauwelaerts was too eager to find a manuscript connected with Gillis. The manuscript has also been described within the online project Medieval Manuscripts in Dutch Collections, but here, too, things are not completely straightforward. Searching for the Epitome Aegidii yields only the manuscript Leiden, UL, VLQ [Vossiani Latini in quarto] 119. When searching directly for BPL 191 BA you find it with as its title Epitome legis Romanae Visigothorum, which is in itself not wrong, but not complete either. A few years ago Karl Ubl (Universität Köln) started the Bibliotheca legum, a project dealing with early medieval law in France. The project deals with many texts and a multitude of manuscripts, including those with Roman law texts and the early medieval law codes conveniently known as the Völkerrechte, “laws of the nations”, because they were addressed to the populations of certain territories. The Breviarium Alaricianum, also known as the Lex Romana Visigothorum, is among them. The Epitome Aegidii, too, figures in this project, currently with thirty manuscripts. Here it becomes clear the Dutch manuscript portal should also refer to Leiden, UL, BPL 114, also consultable online. When you search for “Epitome edited by Aegidius” you will find it together with BPL 191 BA, but without Voss. lat. qu. 119. The Manuscripta juridica database at Frankfurt am Main uses the term “Lex Romana Visigothorum (“Breviarium Alarici”) (Epitome Aegidii)” and offers 25 manuscripts. The Epitome Aegidii is also among the many subjects in the opus magnum of the late José Maria Coma Fort. His book Codex Theodosianus: historia de un texto (Madrid 2014) is available online in the digital repository of the Universidad Carlos III de Madrid (PDF; 3,8 MB). Last year Faustino Martinez Martinez reviewed this book most approvingly for the online journal Forum Historiae Iuris. Here I can scarcely do justice to the efforts of José Coma Fort. He mentions Gillis at several turns and discusses his edition in detail at p. 371-375. He concluded the manuscript Gillis used is probably no longer extant. Coma Fort brings into relief the way Gillis’ edition was almost unknown until Meerman’s reimpression, and he looks in particular at the discussions concerning the Epitome Aegidii of humanist scholars such as Bonifacius Amerbach, Johannes Sichard and Johannes Cujacius. Did they willingly ignore the editio princeps? Even today it can be considered a rare book. One of the earliest general bibliographies, Konrad Gessner’s famous Bibliotheca universalis (Tiguri [Zürich] : Froschauer 1545; online at e-Rara) has an entry for Petrus Aegidius without his legal work (p. 543). The USTC has references to eleven copies. Using the Karlsruher Virtueller Katalog I could add copies at Lausanne, Vienna (ÖNB, online) and Heidelberg. The Vatican Library, too, has a copy. The tenacity of Wouter Nijhoff and especially M.E. Kronenberg in creating together the Nederlandsche bibliographie van 1500 tot 1540 (‘s-Gravenhage 1923-1971) comes only sharper into view for current scholars with so many resources within easy reach online. In their bibliography NK 15 is the entry for Pieter Gillis’ book, and NK 1550 deals with Martens’ edition of More’s Utopia. Dirk Martens of Aalst printed at Louvain in 1516 yet another editio princeps, the first edition of the book on legal argumentation by a Dutch lawyer, Nicolaus Everardi (around 1462-1532), his Topicorum seu de locis legalibus liber, a work I studied for my Ph.D. thesis. In 2011 I presented here a post about the digital versions of several sixteenth-century editions of this book, incidentally one of my most often read posts. It is only fitting to revisit in the 200th post of my blog Louvain in 1516. At the end of this post I realize how I like to bring things together in one post. Hopefully you will not mind the way I led you here to such important resources as the Bibliotheca legum and José Maria Coma Fort’s great book on the transmission of the Codex Theodosianus! University College London organizes on June 30 and July 1, 2016 the graduate conference Imagined Worlds in the History of Political Thought, an event also in coniunction with the quincentenary of Thomas More’s Utopia. You can send a proposal for papers before April 15, 2016, by mail to conference@historyofpoliticalthought.net. This entry was posted in Manuscripts, Scholars and tagged Belgium, Early Modern history, Legal history, Legal humanism, Low Countries, Netherlands, Political history, Rare books, Roman law on March 11, 2016 by rechtsgeschiedenis. Theatrical representations of a trial can enthrall an audience. Even when you know actual proceedings were different you are lured into understanding matters in the way they are played in the theatre. Authors and publishers were not slow to realize the attraction of the theatre for book titles. In a German research project several books with the word “theatre” in their title printed between 1500 and 1800 have been brought together. Among them is a considerable number of books concerning law and justice. The project was finished a few years ago, but I think it is worth looking at here. The project at the heart of this post has been supported by the Herzog August Bibliothek (HAB) in Wolfenbüttel. Earlier on I had not really noticed this project at the website of this research library with a focus on Early Modern and baroque literature. However, in the end this notice did awake my curiosity. Scholars from the Universität Kassel worked together with the staff of the HAB to create the project Welt und Wissen auf der Bühne – Theatrum-Literatur der frühen Neuzeit. “World and Knowledge on Stage – Theatrum-Literature of the Early Modern Period”. The metaphor of the theatre helped to create a visual image for multiple purpose, not just constructing a setting but also the disposition and communication of knowledge. Apart from “Theater” and “Theatrum” authors and publishers used words such as Schau-Bühne and Schauplatz, and of course other languages used their own versions of these words, for example théâtre, teatro, schouwtoneel and schouwplaats. Apart from works in German, French and English Dutch, Spanish and Italian works were within the orbit of the project, The project at Wolfenbüttel aimed at creating a portal with bibliographical information and direct access to some 200 titles. Despite this multilingual starting point the project website is only accessible in German, in clear contrast with the HAB’s website which can be viewed in German, English and some pages even in Latin. At the project website you can go directly to each of the digitized works, execute a full text search in all titles or in a particular work, or visit first the repertory and benefit from the information about the works brought together here. There is no shorter way to view the qualities of the project than starting to look at a particular work. I have chosen a work by Peter Dahlmann, his Historischer Schauplatz Vornehmer und berühmter Staats- und Rechts-Gelehrten (2 vol., Frankfurt and Berlin, 1710-1715), and I selected it because it was the first work in the list with the word Recht (law) in its title. This biographical dictionary appeared anonymously, but Dahlmann published a similar more general work in 1710 which made his authorship plausible. The description of this work with twenty-seven biographies is most useful, in particular for the overview of the content, information about the context and background, and bibliographical information. When I looked at the list of extant copies of Dahlmann’s book I somehow became wary. A quick search in the Karlsruher Virtual Library shows indeed more copies than indicated here. The copy of the first volume at the Max-Planck-Institut für europäische Rechtsgeschichte, Frankfurt am Main, too, has been digitized, as announced on the project page at Wolfenbüttel, but I was really surprised to find this title in Frankfurt within the collection of German legal journals from the period 1703 to 1830. Anyway, this title is certainly not widely available in German libraries: VD18, the bibliographical project for eighteenth-century German imprints, has not yet included any copy from the five participating libraries, but the Staatsbibliothek in Berlin, the Sächsische Landesbibliothek in Dresden and the Bayerische Staatsbibliothek in Munich do have a copy of the rare second volume, which has been digitized at Munich. Checking the information about surviving copies seems advisable. With some 35 works in a selection of 200 books law and jurisprudence seem well represented. It is a pity that in view of a total of some 180 descriptions you find here for just seven legal works a specially created description. However impressive this list, it does lack at least one noted legal work, the Amphitheatrum legale of Agostino Fontana (4 vol., Parma 1688 – online, Hathi Trust Digital Library). On the other hand Jean Bodin’s Universae Naturae Theatrum (1596) has been included with a useful introduction. Sadly the list does not have for each work a description or a link to a digital version either from the collections of the Herzog August Bibliothek or elsewhere, and I have tried to supply such additional information here. On the other hand, in the case of the Theatrum Europaeum one is duly guided to a digital version of a later edition (21 vol., Frankfurt am Main 1646-1738; online at Augsburg). In mentioning the Theatrum Europaeum we arrive at a central problem in dealing with this project. If the scholars creating the project had already difficulties in dealing with legal texts, how can a general user determine the nature of a particular work? In my view there is only one road to answer this question, to take the time to get hold of a work or to view a digital version, and to look beyond the title page. In this respect it would also have been helpful to have a translation of the book titles in Polish. In an earlier post I wrote about the Theatrum Europaeum as a useful source for the text of peace treaties. I am sure I have missed some works with legal contents in this list, but I have also excluded on purpose in my selection works on geography which surely do contain information about legal matters in a particular region or country. How representative is the selection of works at Welt und Wissen auf der Bühne? It did cross my mind to look at the digital projects for Baroque literature at the Universität Mannheim. The CAMENA project created a network of digitized works from the Early Modern period, with for law a number of works in the section Historica & Politica. The Universal Short Title Catalogue (USTC, University of St. Andrews) has as its aim bringing together sixteenth-century books. I invite you to check the digitized works at the Heinsius Collection of Neo-Latin works published in the Dutch Republic (Universiteit Leiden), to visit the website for Nordic Neo-Latin literature (Universitetet i Bergen), or to walk through the alphabetically ordered Philological Museum (Dana Sutton, University of Birmingham). The German project does include only three titles for music, and the USTC, too, gives a very restricted number of similar titles. In its present state it does already offer a fairly complete overview of literature with some form of theatre in its title published during this period. More incisive is the question how important these legal works were and are. Do we have here a parade of the great and influential works? It is safe to say that at least De Luca’s work was most influential. Of some authors we have here less well-known works. Lünig (1662-1740) is better known for his massive Das Teutsche Reichsarchiv (24 vol., Leipzig 1710-1722; digitized at Augsburg) and his Corpus iuris militaris (2 vol., Leipzig, 1723). However, his book on ceremonial law is indeed a landmark, and its importance has been highlighted in a book by Miloš Vec, Zeremonialwissenschaft im Fürstenstaat. Studien zur juristischen und politischen Theorie absolutistischer Herrschaftsrepräsentation (Frankfurt am Main 1998). The selection of lawyers in Dahlmann’s Historischer Schauplatz is definitely not what you would expect nowadays of a book with juridical biographies, but this helps in fact to become aware of our own predefined ideas and conventions. One of the strengths of the project at Wolfenbüttel and Kassel are the references to relevant literature, even if this is often restricted to literature in German. A number of these modern scholarly texts can be read online. The project title World and Knowledge on Stage itself immediately remembered me of proverbial lines by Joost van den Vondel, a seventeenth-century Dutch author: De wereld is een speeltoneel, elk speelt zijn rol en krijgt zijn deel, “the world is a theatre, everyone plays his role and gets his part”. These words were composed for the opening of the municipal theatre of Amsterdam in 1637 and put above its entrance. Maybe this echoes a thought expressed by Erasmus in his Praise of Folly (ch. 29). A second proverbial saying of Vondel brings us closer to law: “De wetten zwijgen stil voor wapens en trompetten” [The laws are silent in front of weapons and trumpets], which alludes to the Latin proverb inter arma silent leges. The metaphor of the theatre helps us to look for the roles people played and the subjects brought to the limelight or left in the wings. It struck me how many titles in the German project refer to wars and conflicts. Any title with the word theatre invites you to enter a different world. You might encounter unfamiliar laws or meet a kind of justice that functions differently than you had imagined before. This entry was posted in General and tagged Colonial history, Criminal law, Cultural heritage, Germany, Legal history, Legal iconography, Public law, Rare books on April 16, 2015 by rechtsgeschiedenis. Sometimes a post on this blog is part of a series. Some posts discuss a particular theme from a number of perspectives. Legal iconography is one of these recurring themes. Sometimes I can choose at will from my list of interesting subjects, but this time a post on a well-known blog prompted me to start writing about legal portraits. On my website I deal with legal portraits to some extent on the page for digital image collections. I realized that in order to tackle a question in that recent post concerning the erased name of a lawyer in an engraving, my list of image databases with legal portraits might be helpful indeed to find out whose portrait you are looking at, and in finding legal portraits at all. At In Custodia Legis, the blog of the law librarians of the Library of Congress, Nathan Dorn published on October 19, 2012, a post called The Faces of Renaissance Law. Dorn wrote about the recent acquisition by the Library of Congress Law Library of two rare sixteenth-century Italian books with images of medieval and Renaissance lawyers, Illustrium Virorum Iureconsultor[um] imagines (…), by Marco Mantova Benavides (1489-1582), printed by Bolognino Zaltieri (Venice, 1570), and Imagines quarundam principium, et illustrium virorum (Venice: Bolognino Zaltieri and Niccolo Valegio, 1569). Five of the six lawyers in the pictures from these books shown in Dorn’s post can be identified immediately by the text engraved below in the images, but in the sixth image a part of this text with the name of a lawyer has been erased. The remaining text, “floruit Roberti regis Sicilie temporibus quem patrem legum uocat Ancharanus” says he lived in the times of king Robert of Sicily who Ancharanus called his father of laws. Pietro d’Ancarano (around 1330-1416) seems to be referring to Robert’s support of the University of Naples. It is one thing to find a portrait of lawyers in the past, but another thing to identify somebody correctly as in this case. On my website I mention a number of portrait databases and websites of museums with a large portrait gallery, but here the question was clearly a bit different. How to find a digital version of this book when the Library of Congress states this book is very rare? This assertion was easily to be proved, with one qualification: one can find other editions of this book, but they contain different images. Mike Widener, curator of rare books at the Lilian Goldman Law Library (Yale University, has created a Flickr gallery of the images in the edition Rome 1566 of this book. He gives Antoine Lafréry as the author of this book, not Benavides, who was the collector of the 26 images in the first edition. Widener discusses these portraits and other portraits in a number of posts for the Rare Books Blog of Yale Law Library. In the edition of 1566 our lawyer has not been portrayed. Instead of plodding along all roads and byways I took to find the missing name I had rather tell you where and how to find a solution for the question about the book at the Library of Congress. One of the portrait databases presented on my website contains indeed all images from later editions. The Virtuelles Kupferstichkabinett (The Virtual Engravings Cabinet), a project of the Herzog-August-Bibliothek in Wolfenbüttel, the Herzog-Anton-Ulrich-Museum at Braunschweig and the Deutsche Forschungsgemeinschaft, gives lots of information on the image in question. The man portrayed is Riccardo Malombra, born in Cremona between 1259 and 1264. He died in 1334. For information on him one can turn to the article written by Andrea Labardi in 2007 for the Dizionario Bibliografico Italiano which can be consulted online, too. The missing text in the book at Washington, D.C. is “Ricardus Malumbra Cremonensis”. The date of the edition at Wolfenbüttel is given as between 1567 and 1570, and when you compare it with the copy at Washington, D.C., you can spot indeed some differences, for example the number of the engraving given here in the corner below right. With more than 4,000 images the Legal Portraits Online collection of Harvard Law Library certainly is an important and often exclusively mentioned resource, but it is surely possible and useful to look elsewhere, too. To start with Mike Widener, he has also digitized for Flickr 36 portraits from the book by Lodovico Vedriani, Dottori Modonesi (..) (Modena 1665) with professors from the university of Modena, a number of portraits showing Hugo Grotius, and finally a few dozen scattered portraits of lawyers. A first indication that it is indeed interesting to look not only at the image results of the average online search machine, is the very fact of finding Italian images in a German library. In fact a number of German projects seem to cater for a lot of questions which transcend national borders. The Frankesche Stiftungen at Halle an der Saale, an institution with a rich history in eighteenth-century German pietism, has a fine portrait database where you can find lawyers among the professions indicated (enter “Jurist” in the Berufe field). The Fotoarchiv at Marburg has created a Digitaler Porträtindex where you can search in the same way for portraits in the collections of eight German cultural institutions. The Bildindex der Kunst und Architektur, the main image project at Marburg, too, can be used in this way. When doing my search for the name in this particular image I was surprised to find that the Deutsche Fotothek, a project at Dresden, does not only contain photographs, but also drawings, engravings and paintings. My surprise was even greater, because this database brought me at first to the image of Riccardo Malumbra discussed here. Thus the database of the Deutsche Fotothek leads you to images and data also present at the Virtuelles Kupferstichkabinett. However, at the website of that project you can use also Iconclass, a Dutch systematic classification of subjects in art. Last year the death of Friedrich Carl von Savigny in 1861 was commemorated in particular with the publication of a volume with fifty contemporary portraits of this German legal scholar. This post started with a question concerning an Italian lawyer. It is always possible to find Italian portraits using the general gateways to art history. Nowadays Art.Historicum.net is one of the most useful portals for art history. Combined with the overview of online database of ArtGuide (Heidelberg and Dresden) and the fine list of links maintained by the RKD (see below) you will surely find many portraits. 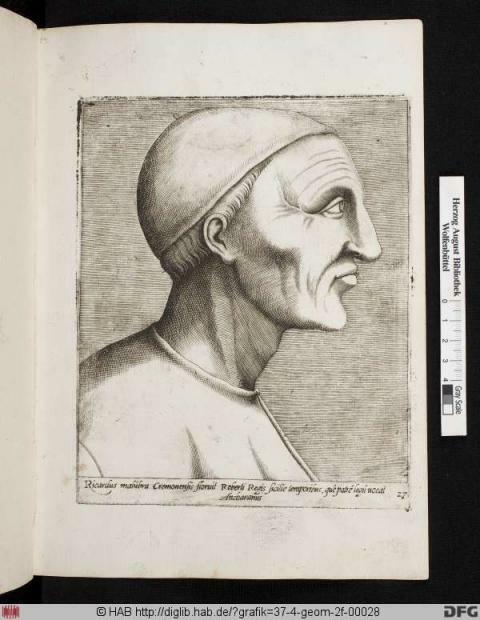 However, it is really worthwhile to check the 10,000 portraits in the FACIES database of the Biblioteca Comunale dell’Archiginnasio in Bologna. Even when you got to acknowledge the relatively small number of lawyers in it, this database does connect them to other resources as well. Speaking of Dutch projects, the Netherlands Institute for Art History (RKD) at the Hague has a number of online databases. Among them is RKD Portraits. Here, too, you can search for particular professions. Lawyers can be tracked down by using in the first general search field the Dutch term jurist. Utrecht University has coupled its online database of historic professors with the fine painting gallery in its holdings, and provides links to other databases as well. The image database of the former Dutch Institute for Legal Iconography with some 12,000 images, which used to be accessible only for subscribers at this link of the Dutch Royal Library, has been recently integrated at The Memory of The Netherlands portal. The University of Amsterdam has created a digital portrait gallery with paintings collected for this university and its forerunner since 1743. The Vrije Universiteit Amsterdam has a digital image collection with some 1,500 images for the history of Protestantism, including many portraits. For American history, too, one can look beyond Harvard’s Legal Portraits Online. The Smithsonian Institution at Washington, D.C., has an online database for its National Portrait Gallery. Incidentally, for English history one should of course turn to its namesake in London with over 160,000 images. The New York Public Library has created Historic and Public Figures: A General Portrait File to the 1920’s with some 30,000 photographs. Cornell University has an online collection of political Americana which goes even a step further, from an image database to the uses of images in campaigning and publicity. For American women in legal professions the information – including images – at the Women’s Legal History portal of Stanford University is invaluable. Libraries and Archives Canada provide for Canada an image portal with a generous selection from Canadian holdings. When you want to find a portrait of Hugo Grotius you will easily find useful results. When preparing this post I realized that the proof of the pudding for the image databases mentioned here is to find a portrait of a less well-known lawyer. For convenience’s sake and for my own interest I started looking for an image of a portrait of Nicolaas Everaerts (latinized Nicolaus Everardi) (around 1462-1532). No contemporary portraits of him exist. Because of the variant spellings of his name (e.g. 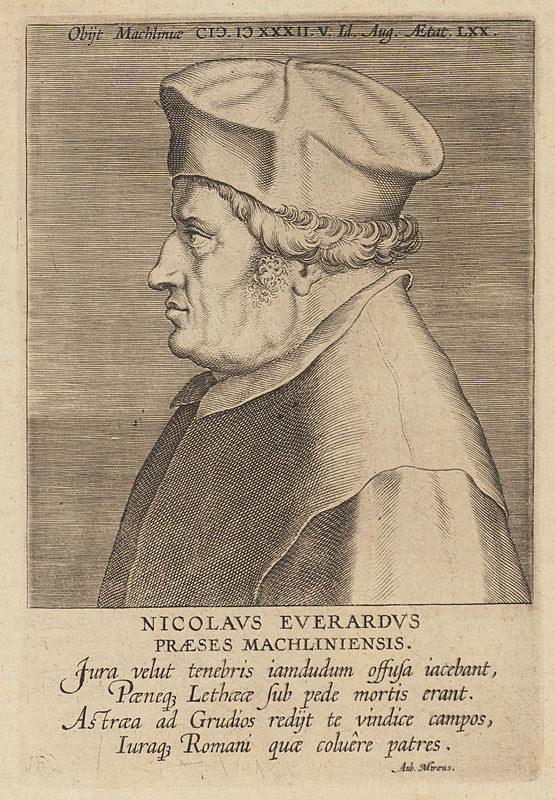 Everhardi, or his first name as Nicolaes) it is not easy to find images of this lawyer who became the head of the Great Council at Malines, the highest court of the Habsburgian Low Countries. Harvard’s Legal Portraits Online comes here into its own with two images. I have never seen the image at the left elsewhere. To be honest, its execution is a bit clumsy, and the older engraving was clearly the model for it, although inverted. Its dimensions are quite small (57 x 43 mm), and the original source is not given. The older image is not as easily found as I suspected it would be. The Europeana portal helped me in getting more details, but some questions remain. In which work did Aubertus Miraeus (1573-1640) use the engraving by Philip Galle (1537-1612)? The Rijksmuseum in Amsterdam has almost all these details on this engraving. The engraving comes from Miraeus’ Illustrium Galliae Belgicae scriptorum icones et elogia (Antverpiae 1604), a series of 52 portraits of Dutch and Belgian authors. Again, it is from the perspective of art history that you will find here an answer. When I created my webpage with links concerning digital image collections and legal iconography I often doubted the value of the links belonging to the realm of art history, but I have become convinced that you might need them indeed. A search strategy for legal portraits can be sketched at least in outline: start with the resources dedicated to legal portraits, continue with general portrait galleries and general photo galleries, and switch to resources for art history when the other ways bring no results. On my webpage I point also to digital heritage portals and to other specific resources for images which relate to the vast fields of legal history. National image portals are also often helpful, as are the websites of institutions in the field of women’s history. In my experience it is sound advice to look also at the image collections of major museums – here the Rijksmuseum – and to take the searching order indicated here only as a guideline. By changing the sequence of links to be visited you might in specific cases get quicker and more relevant results. Sometimes results come from unexpected corners: for example, the Château de Versailles has a fine collection of portrait engravings in its image database. I wish you good hunting! Germany takes quite some space here already, but it is possible to add some online German portrait databases. The Tripota – Trierer Porträtdatenbank (Universität Trier) contains more than 8,000 portrait images, mainly from the collections of the Stadtbibliothek Trier. The links section of this website gives an excellent overview of digital portrait collections worldwide. In the Regensburger Porträtgalerie (Universität Regensburg) you will find some 5,000 portraits from the collections of the princes of Thurn und Taxis. The European aristocracy is well represented here. Utrecht University contributes to the new website Academische Collecties a catalogue with some 1,800 images – paintings, drawings and photographs – of professors. At the same website you will find some 500 portraits from the collections of the Universiteit van Amsterdam. This entry was posted in General and tagged Art, Legal history, Legal iconography, Rare books on November 13, 2012 by rechtsgeschiedenis.